(TibetanReview.net, May30, 2015) – The Dalai Lama concluded at the Upper TCV school, Dharamshala, India, on May 29 his ninth annual introductory Buddhism teaching for Tibetan youths. The more than 4,500 people who attended each of the three-day teachings included school-going children as well as college and university-going youths, besides many others. This year’s teaching was on ‘A compendium of Ways of Knowing: A Clear Mirror of What Should be Accepted and Rejected’. The topics covered included Cognition, Indecisive Wavering as in factors that induce indecisiveness; Inferential Understanding and other Buddhist theories such as Maadhyamika-Svatantrikas, Madhyamika-Prasangikas and the Vaibhashikas etc. The Dalai Lama began by explaining how the Buddhism of Tibet was based on and a continuation of the Nalanda tradition of ancient India, that people should not just recite prayers but also study and understand the Buddhist texts so as to be able to better preserve it and promote its values. 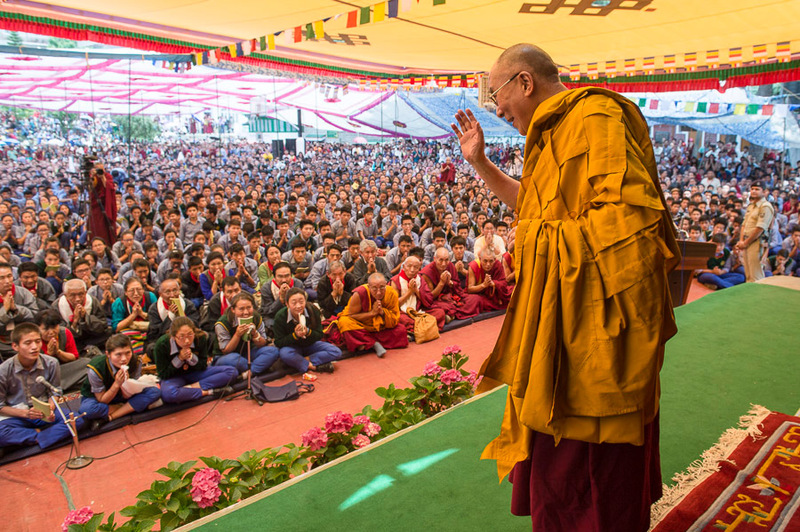 The Dalai Lama led a ceremony for generating the awakening mind of bodhichitta and also answered questions from students at the end of his teachings. The teachings concluded with the conferment of the Avalokiteshvara and Jampeyang empowerments. Before that, the Tibetan Children’s Village family made a Long-Life Offering to the Dalai Lama.